The Burning Sky has received the most amazing reviews from some trusted fellow bloggers. It being fantasy instead of the usual dystopian novel made me even more excited for it. 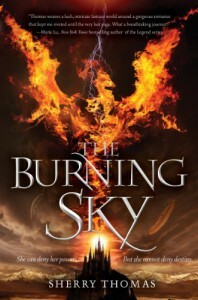 Unfortunately I did not enjoy The Burning Sky as much as I hoped but overall it was an enjoyable read. The beginning of the book was a bit confusingand quite frankly boring. I just didn't know what was going on and was very confused at all the different mages. Also, the plot wasn't gripping enough for me to care. However a 100 pages in, the book finally starts getting interesting with the emergence of the gender bender plot line However I expected a ton of humor to come out of that but that plot line was wasted. I've watched a ton of gender bender dramas and movies and just had some expectations of how entertaining the plot should be. Even with disappointing start, the book did start getting more interesting and I started to at least somewhat understand who the antagonist was and the history behind the mages and the world they are in. I thought Iolanthe, the main protagonist, was a bit annoying. She tried opposing Titus in every way. Even if it was on the breakfast menu. It kind of frustrated me but the book redeemed itself through Titus' chapters. In all honesty it took me a while to get through this book. I kept on expecting it to get better but it never did. The plot line was uninteresting to me overall and I just wished that we had more character depths as well as developments from them. Their relationship was one page a hate relationship and then the next page it switched to a love relationship. Even with all of my issues with the book, I did enjoy it overall. I wish that in the next book we would get to find out more about the world in The Burning Sky as well as find out more about the characters and see them develop and grow up. I would recommend this book to fantasy YA readers especially since so many of my friends really enjoyed it.